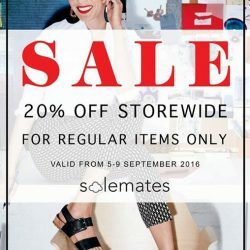 Check out Solemates' Black Friday Sale at [email protected] Ridge from now till 25th November 2016! Enjoy 30% off regular priced items and 70% off items storewide! Get yourself a new pair of shoes or even two from Aerosoles, Aerosoft, Bar, Flippy, Hergos, Ken Koh, Pansy and Sabatini! TGIF! Celebrate Hari Raya Haji with a pair of new shoes! Enjoy 20% off storewide for all regular priced items from 9-13 September 2016! Start the week fresh with a pair of new shoes! 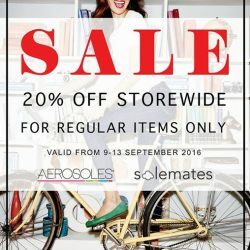 Enjoy 20% off storewide for all regular priced items from 5 - 9 September 2016!